While “Coogan’s” has been dropped from the race title there is no doubt this race will live on in the minds of New York runners as Coogan’s. And judging by today’s spectacle it lives on as a colorful, talent packed race with an edge over New York Road Runners (NYRR)’s bread and butter offerings. 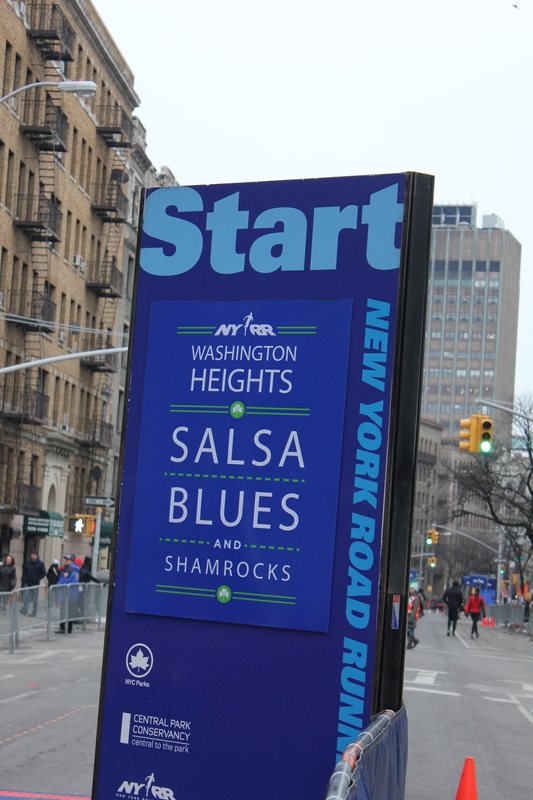 One of a handful of NYRR races held outside of Central Park, it takes in the hills of the northern Manhattan neighborhood of Washington Heights. 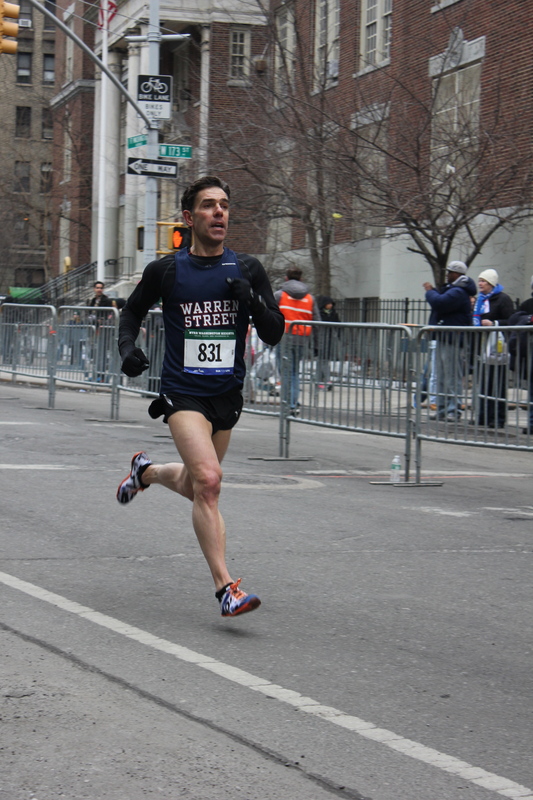 Once again it was the opening race in the NYRR club race series that ends in December 2014. It’s been two years since I last did this race. Injury left me spectating in 2013 – a much overrrated occupation in the cold wintry months, as Sham will testify. With my 50s on the horizon my main objective was the usual damage limitation – to run as close to the 16:02 I ran in 2012 as possible. Well I ran 16:10. I was pleased with that, no mean feat given how hard I am to please. Sham and I usually get to this race by picking up the subway at Marble Hill, in The Bronx, after the Metro North train from Peekskill. This time we decided to stay on the train until Harlem-125th Street and then run the 3 miles to the start. 5K is so short I figured it needed supplementing to make the train ride worth it and this way Sham would get a run in. The race was full of incident and entertainment. First incident – soon after the start a dozen runners were piled up on the road in front of me. A scrappy hurdle got me out of trouble. Then entertainment – descending the hill in Fort Tyron Park “A Hard Day’s Night” (how apt) blared out from a band on the sidewalk just as it did in 2012. This out and back course is perhaps the toughest of all NYRR races. It takes in the hills, and the highest point, of the northern tip of Manhattan. There are two hills to climb on the way out and two to claw up on the way home. But at least after cresting the last hill at 2.5 miles it’s then a long downhill straight into the finish. My Garmin recorded it all including the several minutes until I remembered to stop it. For most of the race I traded positions with team mate Sebastien B. 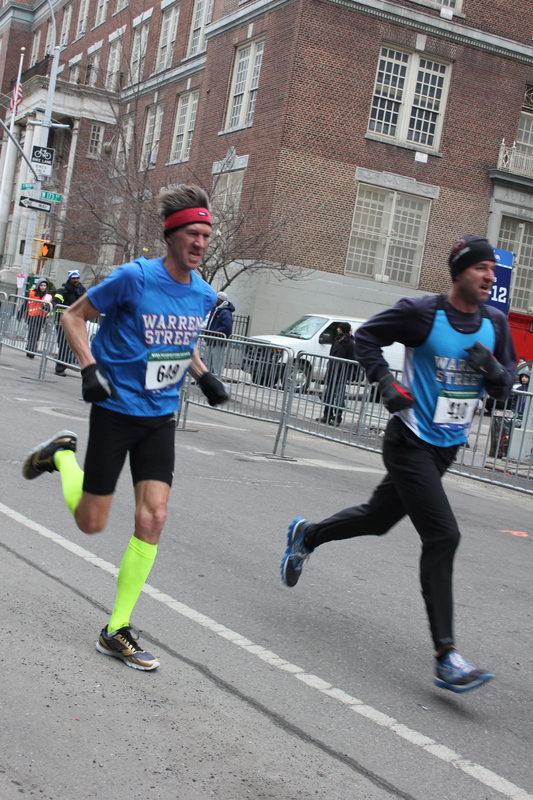 (one of Warren Street’s NYRR Club Night nominees) but he edged me in the last few metres. My 16:10 finish time was good for 23rd place, of 6,182 finishers, first masters and 2nd age grade with 89.78%. Close to the finish with Seb hot on my heels. But more importantly, after a mediocre 2013, Warren Street Social and Athletic Club to be first men’s masters team (Danny Tateo, John Nelson and me) and third men’s open team (Robert Dugger, Sebastien B., Carlo Agostinetto, Ryan Korby and me). 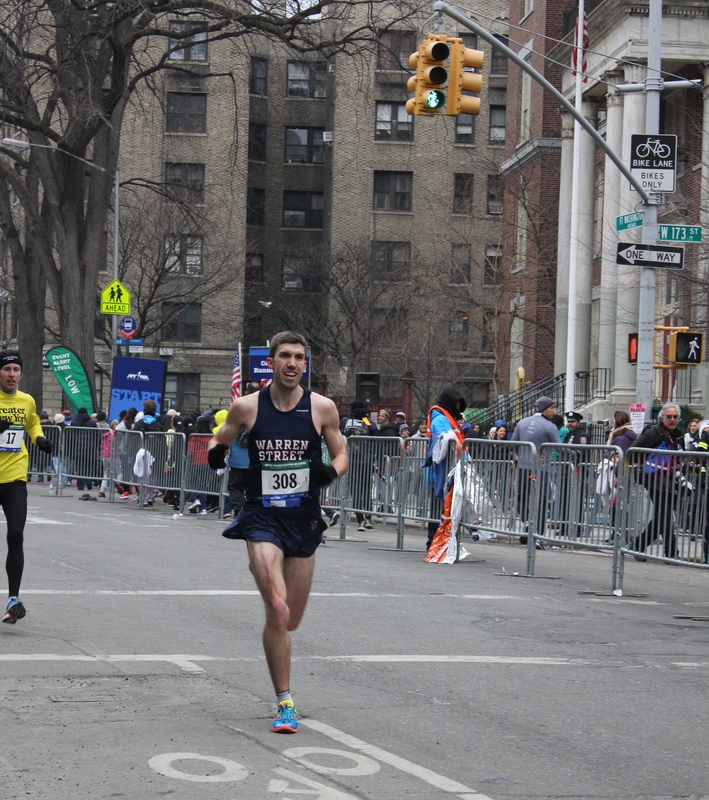 See here for NYRR pictures, story, results and more. 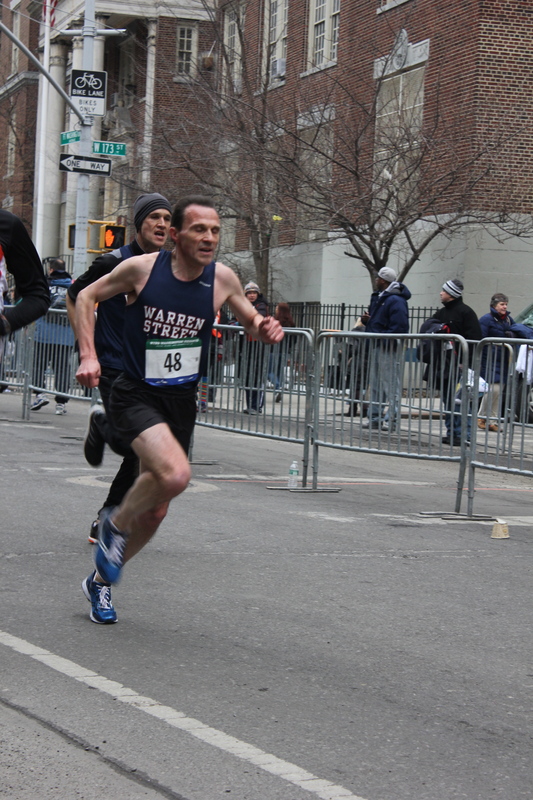 Robert was the first Warren Street Runner to cross the finish line. John and Mike Guastella running hard to the finish. Danny in good form just before the finish line. This year Sham and I missed what truly defines Coogan’s – hundreds of sweaty runners squeezing into Coogan’s Restaurant to enjoy free beer and pub grub with intoxicating post race analysis. Instead we ran the 3 miles back to Harlem 125th Street and treated ourselves to a $1.75 toasted bagel with butter and coffee combo from my traditional post long Saturday run deli. Long live austerity. This entry was posted in New York, Races, Running and tagged new york, NYRR, running injuries, Warren Street Social and Athletic Club, Washingston Heights. Bookmark the permalink.